I was fortunate to acquire my first female Norwich from Carole Foucrault in 2007. Since then, I have been involved in the sport of showing/breeding Norwich. What I love most about Norwich Terrier is their inquisitive and fun-loving nature. I hope to continue learning about this breed and introducing these spirited four-legged pooches to others through our regional club's outreach and educational events. My life would be a bit dull without the company of Norwich terrier! After many generations of German-import Shepherds, we decided we needed a smaller, more tote around friendly dog. I started researching the many smaller breeds, and kept coming back to the Norwich Terrier. And we have not been disappointed! They are the most wonderful dogs. Our first two came in 2007. Lily, our forever companion and Sam, who turned out to be our first show dog. And Sam did so well, that we got hooked on showing dogs. It led to us showing very special dogs and producing our own pups under the kennel name MICHAN. 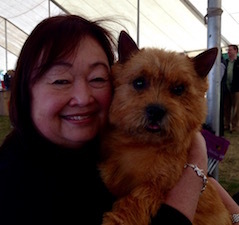 We also enjoyed meeting other dog people and have made, I am sure long lasting friendships with many. The club has opened up a new avenue for having fun with our furry family, and meeting more folks with similar interest! I got my first Norwich ten years ago from Sharon Curry. The agreement we made with Sharon was that she would help us show him until he finished his championship. It has been quite a journey for us, in fact he finished his championship in just a few weekends. From then on we were hooked! We now have 3 finished champions and our youngest boy, Chip is just starting his agility career. I am honored to be a part of the Norwich Club and am excited to share my knowledge of the breed with other members. But the best part of having this lovely breed is making so many friends with like interests. We are having the time of our lives! The Norwich has enriched Christine’s and my life for the past ten years. What a wonderful breed! Just as important are the great Norwich owners we have come to know. I am starting agility competition with our Chip. The main reason is that he enjoys it so much. That is what it should be all about.